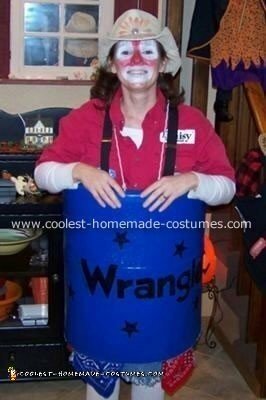 I first started with the clothes I would wear for this rodeo clown costume. I made the skirt out of an old pair of my husband’s wranglers. I found the instructions on how to do this online. I then printed off sponsors labels onto sticker paper and sewed them on an old button up shirt. Used a pair of my own tube socks and tennis shoes. Used different colored bandannas to tie onto belt loops. Used suspenders to hold up skirt. Bought a cheap cowboy hat and glued the flower on. My husband then rolled the hat in dirt so it looked used. I painted my face with clown paint from the store. My husband got me the barrel and cut the bottom out of it. I painted it solid blue first and then painted the designs on it. I had him drill some holes for some rope and I fit in and put the rope over my shoulders. I didn’t wear the barrel all night but it work to sit on. I didn’t spend much money but it was a lot of work.